People rarely see these insects. 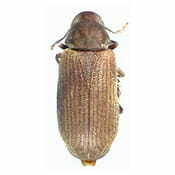 Adult beetles range from 2-5 mm long and are reddish to chocolate brown in color. Eggs are 0.5 mm long, white, and teardrop shaped. Larvae are white, C-shaped, and 5-6 mm long when fully developed. Pupation takes place just beneath the wood surface. Heavily-infested wood becomes riddled with holes that are packed with frass – wood that has passed through the digestive tract of the beetles. In coastal areas of Washington wood-infesting beetles cause extensive damage to wooden buildings. Damage often is overlooked, as these insects live in portions of the structure where people seldom see them. Wood breakdown from beetle infestations can lead to serious structural weakness. In addition, chemical treatments and wood replacement to limit insect damage are costly. Hemicoelus gibbicollis (LeConte), a member of the beetle family Anobiidae, causes the most significant damage. Several other anobiid species occur in wooden timbers, but they do not cause serious problems. Infestations usually build to damaging levels over a period of years. Structure-infesting anobiids occur primarily in older homes that have crawl spaces or damp basements. These beetles also infest outbuildings, such as barns or garages. Wooden support timbers, floor joists, and sub-flooring are commonly infested. The insects will attack new hardwoods (maple, walnut, oak) and softwoods (Douglas-fir, cedar, hemlock) or those that have been in service for many years. Larvae also feed on plywood. New replacement wood attached (or scabbed) over old infested wood is more likely to be attacked and shows damage very quickly. Whether or not odor and texture play a part, the new wood has higher nutritional value and attracts the insects. Once established, and if environmental conditions remain appropriate, anobiids will continuously reinfest until only powdery frass (feces) covered by a thin layer of wood remains. Conditions of high moisture, no ventilation, and poor drainage away from the structure encourage development of these insects. Homes in Washington west of the Cascade Mountains are most susceptible, and beetles favor those near coastal areas. Treatment starts with a thorough inspection from a licensed pest control professional with a wood destroying organism endorsement issued by the state. They’ll look for the primary source of the infestation and any conducive conditions. After that recommendations are made for good sanitation practices and/or elimination of conducive conditions. Then a pesticide application maybe preformed when necessary. Chuck Sullivan Exterminators uses Borate products and materials to treat areas of infestations. These materials are usually applied to the flooring, joists, beams and sill plate areas of the sub-structure of the building.